It's Grymn Out There. : After the troops. They are drying nicely as we speak and the picture shows 3 Glaive APCs, a Slingshot AFV and 3 mini turrets to go with the Glaives. The bag has the metal barrels and hatches for the kits in it. 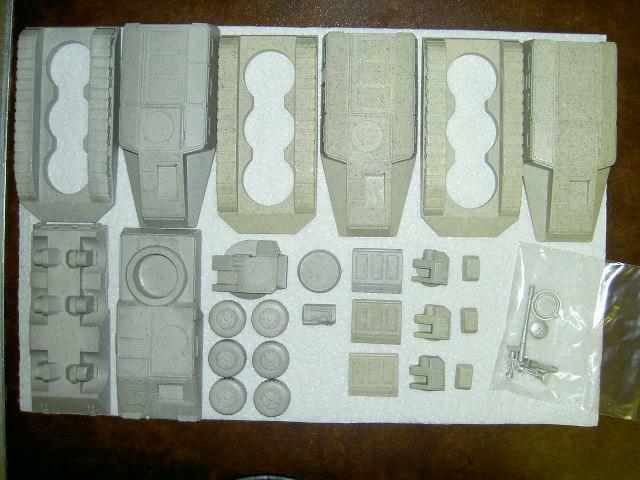 The kits are from Old Crow and they are immaculately cast and even came sanded flat so that they fit together nicely. I have put together Old Crow kits before and they really are excellent value for money. Each of the Glaives will hold 8 troops and will house the infantry sections. The Slingshot will hold 4 troops will house the command section. I don't want to add stowage to the vehicles because I prefer clean, uncluttered lines and there is plenty of room inside the vehicles for extra equipment. Solid project. I like how you map out the progress and actually stick to what you are doing. I have to do that, otherwise I get distracted (hence the bikes...I had an idea and the next thing BLAM!) and don't get much done at all. I hate varnishing so I needed to give myself a pay off by allowing myself to unpack my lovely Old Crow tanks only when the varnishing was done. I am hoping to get them assembled tonight... I think it will be a bit of a smelly one (I have some epoxy glue that has a high ammonia content!). I will be kept busy :). These are excellent choices! They will fit nicelly with the rest of the army. Don't forget to get a few pictures of the apc's with some troops if possible. The combination should be awesome! As soon as these are assembled, I will post some scale pics with humans and Grymn. Old Crow vehicles are exceptionally well made and deserve the free advertising.